Register Log In ECN Forum Forums Photos for General Discussion 2 - 4 - 6 - _ - This We Don't Appreciate! When doing a site survey in Michigan I ran across the panelboard illustrated in the following photographs. I especially liked the wiring on circuits 2,4 and 6. Yeah, but look at all the space in there! wondered if these go to a frame ground? if so someones in for a suprise! wonder where it goes? any one know? Color codes? What are those? 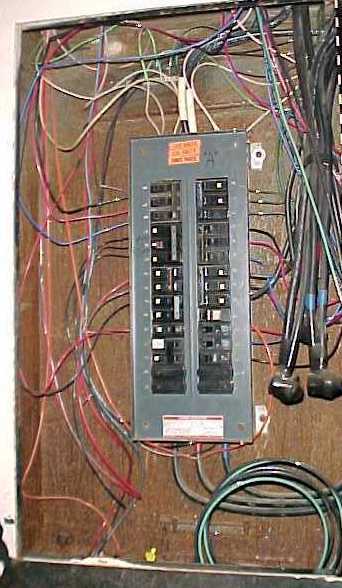 I did a job a few years ago at a local college building here in town, and the entire panel located on one floor of the building had green wires on ALL the breakers. Now that was a mess! The first day I had to unwire some walls so they could be taken down boy to my surprise when I found all the grounds in the boxes and they were hot! Must have been a BIG sale on green wire back in the late 1960's here. Once saw a sub panel in a commercial kitchen. Romex had been pulled through conduit to provide new circuits for some new equipment. Each wire in each piece or romex went to a breaker. The black to one breaker, the white to another, and the BARE!!! wire to another breaker(safetly wrapped in tape). At each outlet, the neutral return path was through the conduit. A piece of white and green wire at box screwed directly to the box. Apart from the green wires connected to the breakers (which is really disturbing and calls into question the competence of the "electrician" who did this) I have seen huge boxes with small circuit breaker frames such as this numerous times in this part of the country. It seems to happen during a service upgrade when an old fuse panel is replaced with circuit breakers. Rather than dig the old box out of the wall and install and fit conduit to a new, smaller box, they remove the obsolete interior and replace it with a new circuit breaker frame, then fabricate some type of cover to dead-front the panel (leaving the old box in place). Question; Are there any NEC issues for doing this type of thing, and have any of you done this before? I hate to mention this, too, but if you look closely at the bottom of the breaker frame in the first photo where the main lugs are located, it appears that there are other, much smaller wires double-lugged in there with the big wires (kinda hard to tell with the dead-front in place). 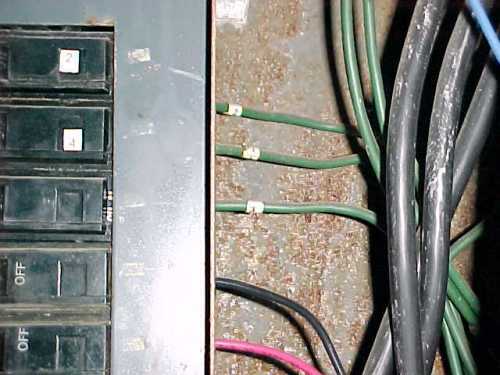 Even if there are some type of "auxiliary" lugs under there, it seems that the circuit (and whatever the circuit supplies) has no protection beyond the OCPD which protects the entire panel. I have installed new guts in old panels on remodel jobs. The installation method was in the specs and new panel manufacturer provided custom covers to mate his panel with the old enclosure. I just got off a school job. THe last Renovation was done about 20 years ago. Maybe the rules have changed ( LOL )but They used Black Red Blue for the 277 volt and Brown Orange Yellow for the 120 volt.